Alterra Coffee Refills for Flavia Here! Alterra Coffee Refills | Flavia Coffee Refills Here! 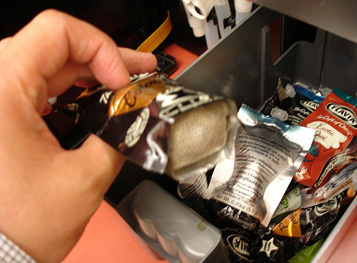 While it may not look like it, the Alterra coffee refills are designed with some very sophisticated technology. First, let's talk about the seal on the bottom of the refill. Did you know that the Alterra coffee refills were sealed with vegetable oil? How cool is that?! How do they even do that?! Well, the seal is created by using a vegetable oil-based material combined with other ingredients. When heated by the water in the Flavia brewers, it expands, thereby hermetically sealing the coffee packet and preventing a leak. As you'll notice in the photo above, the bottom of the Alterra refills have a mesh-like appear-ance. This is a cloth filter inside the coffee packet that drops down, once the water is injected into the refill, and filters your Alterra coffee. 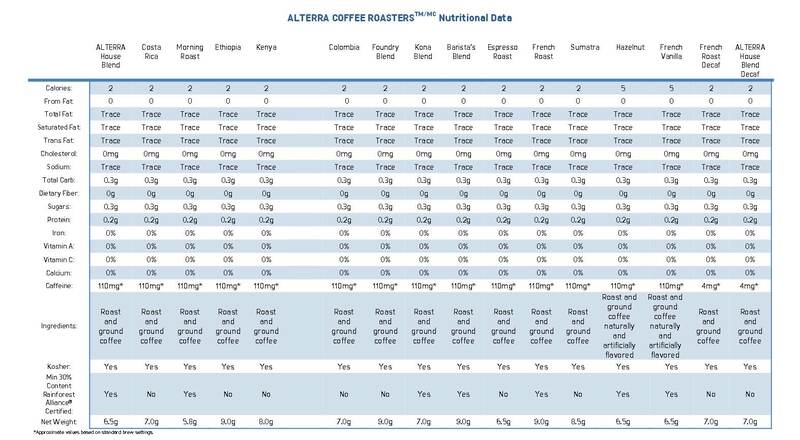 And with most Alterra coffee refills containing only 2 calories per serving, they are a MUCH healthier choice than your standard drive-thru coffee. 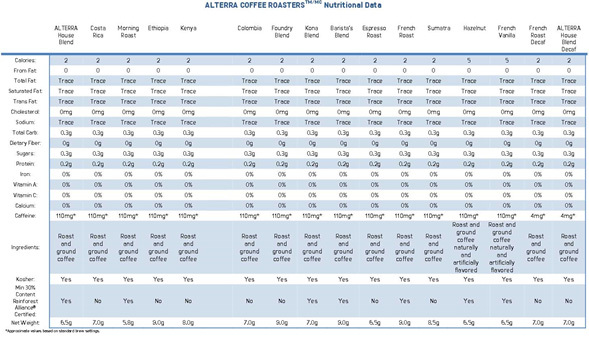 See all of the nutritional data on your Alterra coffee refills by clicking on the chart below to enlarge it.